There is evidence that mGlu2/3 receptors regulate 5-HT2A signaling, interactions that have been theorized to play a role in the antipsychotic-like effects of mGlu2/3 agonists as well as the hallucinogenic effects of 5-HT2A agonists. One approach to unraveling this interaction is through the chronic administration of agonists at the two receptors, which should influence the functional properties of the targeted receptor due to receptor downregulation or desensitization and thereby alter crosstalk between the two receptors. 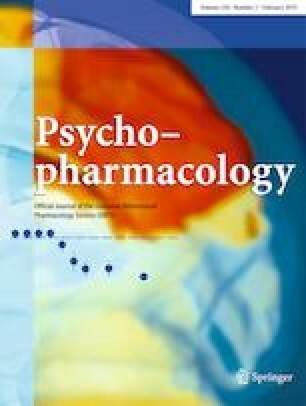 In this study, we investigated whether chronic treatment with the mGlu2/3 agonist LY379268 would alter the behavioral response to a phenethylamine hallucinogen, 25CN-NBOH, which acts as a selective 5-HT2A agonist. We first conducted a dose response of 25CN-NBOH (0.1, 0.3, 1, 3, or 10 mg/kg) to confirm the effects on head-twitch response (HTR) and then blockade studies with either the M100907 (0.1 mg/kg) or SB242084 (0.1, 0.3, or 1 mg/kg) to determine the contribution of 5-HT2A and 5-HT2C to 25CN-NBOH-induced HTR, respectively. To determine whether an mGlu2/3 agonist could block 25CN-NBOH-induced HTR, mice were pretreated with vehicle or LY379268 (0.1, 1, or 10 mg/kg) prior to 25CN-NBOH, and HTR was assessed. The effects of chronic LY379268 on 5-HT2A agonist-induced HTR were evaluated by treating mice with either vehicle or LY379268 (10 mg/kg) for 21 days and measuring 25CN-NBOH-induced HTR 48 h after the final LY379268 treatment. The following day (72 h after the final LY379268 treatment), the ability of acute LY379268 to block PCP-induced locomotor activity was assessed. 25CN-NBOH dose-dependently increased the HTR, a 5-HT2A-mediated behavior, in mice. The selective 5-HT2A antagonist M100907 completely blocked the HTR induced by 25CN-NBOH, whereas the selective 5-HT2C antagonist SB242084 had no effect on the HTR. Administration of LY379268 (10 mg/kg SC) attenuated the HTR induced by 1 mg/kg 25CN-NBOH by ~ 50%. Chronic treatment (21 days) with LY379268 also attenuated the HTR response to 25CN-NBOH when tested 48 h after the last dose of LY379268. In locomotor tests, acute LY379268 significantly attenuated PCP-induced locomotor activity in the chronic vehicle treatment group; by contrast, there was only a trend for an overall interaction in the chronic LY379268 group, with LY379268 blocking the locomotor-stimulating effects of PCP only during the last 20 min. These data are consistent with a functional interaction between mGlu2/3 and 5-HT2A receptors, although the specific mechanism for the interaction is not known. These data support the hypothesis that mGlu2/3 receptors play a prominent role in modulating the behavioral response to 5-HT2A receptor activation. We would like to thank Landon Klein and Mahalah Buell for the technical assistance. LY379268 was generously supplied by the NIMH Chemical Synthesis and Drug Supply Program (CSDSP). These studies were supported by R01 DA002925, R01 DA041336, K01 MH100644, and Veteran’s Affairs VISN 22 MIRECC. These studies were supported by R01 DA002925, R01 DA041336, K01 MH100644, and Veteran’s Affairs VISN 22 MIRECC. Mark Geyer holds an equity interest in San Diego Instruments.